But, aiyah, why so soft on the two goons, YAB?! Only in Penang? Fortunately, or unfortunately, no. Malaysians from all walks of life are double-parking their cars everywhere and breaking all kinds of traffics laws these days. Why? Because they have been allowed to for too long. And when enforcement officers try to do their job, they get abused like this lady officer got abused not just in front of passers by (who did nothing to back her up) but by millions on the the Internet. The two goons in this clip happen to be Chinese. 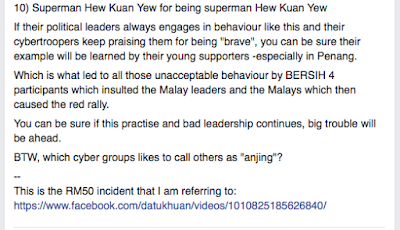 Lim Sian See, a social media personality, has openly expressed shame over their behaviour but blame Lim Guan Eng and Co for having encouraged the culture of kurangajarness towards authority. "The two goons in this clip happen to be Chinese. Lim Sian See, a social media personality, has openly expressed shame over their behaviour but blame Lim Guan Eng and Co for having encouraged the culture of kurangajarness towards authority." Cheap racial distraction tactics are the lowest form of political capital. How nice that you & Lim Lian Whatever are happy to jump on the bandwagon. Try "substance" next time - if you know what that is. Sebab tu saya gunakan "happen to be Chinese". Susah kalau awak ni tak faham bahasa. Lagi susah kalau awak ni memang tak mau faham. Sure, the roles may reverse the odd once or twice but the OVERWHELMING display of KURANG AJAR AND BIADAPNESS...OVER and OVER again....has been from the Chinese, particularly from the DAP racist cult. 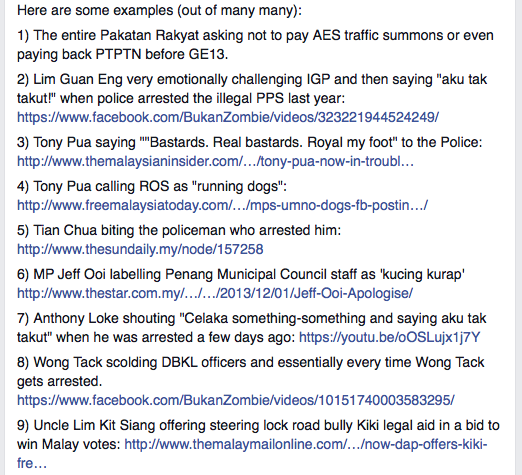 It's a safe bet that if it's a chinese, chances are, 90% probability, they belong to the DAP racist cult. 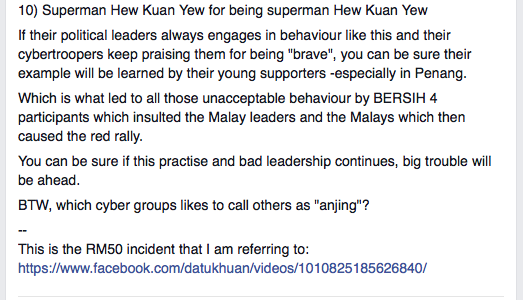 Time for Malaysians to speak up and take action against this KURANG AJAR AND BIADAP DESEASE!! Niat mmg jelas bro, x payah cuba spin lagi. Paid Professionals can do good or otherwise, tu aje aku nak cakap. We have a choice, kan.
Datuk...kipidap...the good job. Perangai anjing...kalau kita takut...salakan mereka akan bertambah kuat! Instead of maintaining her melayuness...that lady officer should bites those dog at its tail! Grow up la Dato! Tak habis-habis nak jadi batu api. 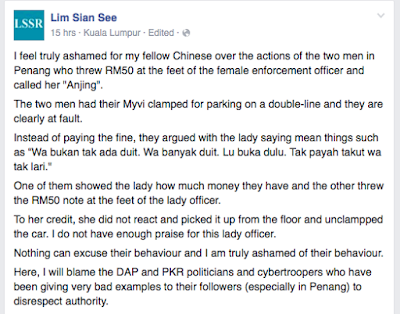 ...they are not happen to be chinese...they are really chinese...those two men are chinese...LGE...Penang...DAP...are chinese infested!...and they are really really rude and provocatives towards the malay...and also towards that humble lady officer which happen to be LGE enforcement officer! Action/inaction is influenced by several factors. In this particular case, 1. If blood is thicker than water, inaction will be more likely than an action; 2. If blood is not thicker than water, there gonna be an action. 3. If Emperor is CM or CM is Emperor same thing will happen: inaction is more likely. 4. If Emperor not CM or CM not Emperor, there will be reaction followed by an appropriate action. Which is which? "In the recent wheel clamping incident on Oct 7, three female officers, Zarina binti Othman, Siti Asa Abu Bakar and Sabrina Mohd Sabri had clamped the wheel of a Perodua Myvi which was parked on the pavement and also out of the parking space. Upon returning to his car, the owner of the car and his friend was not happy and started to argue with the three officers. The two men had tried to forcefully open the clamp by themselves while relentlessly arguing with the officers. Zarina calmly explained to them that a payment of RM50 ringgit was required to take off the clamp on the wheel but the two men continued to act unreasonable and even threw the RM50 on the floor rather than giving it to her. They also threatened the officers after the clamp was taken off saying “You dog, watch out if we see you”. 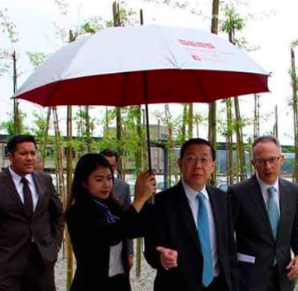 Chief Minister Lim Guan Eng had a press conference in Komtar on Oct 9 to give praise to the three officers from Penang Island City Council(MBPP) for their bravery and calm yet professional attitude in handling the clamping case in Campbell Street. 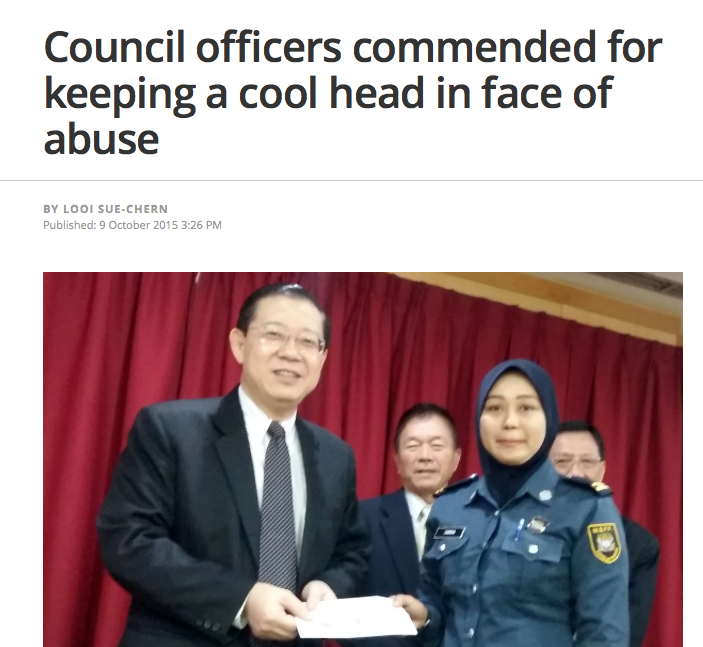 The three MBPP officers each also received a RM200 incentive from the Penang State Government for the courageous and professional work ethics." Tak mau komen Matthias Chang kena jail Sosma ke? Mentaliti komunis, apa nak pelik? Kurang ajar, cakap tak takut lepas tu lari ke luar negara, macam Alvin Tan lah. What you have seen is that typical of the chinese Pai Kia (budak jahat) of kurang ajar. If you have circle of Chinese friends of the pai kia type you will know that this is their typical behavior. The 2 goon will surely escape scotts free!...not like what had happen to Kiki the steering lock lady...she had to beg for an apology from almost every chinese in this country!...and almost every chinese bantai dia kaw kaw...and for LGE with money everything boleh kawtim. 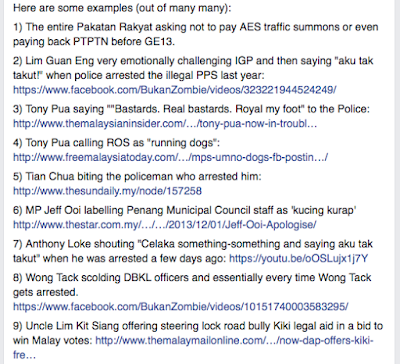 You can see clearly that LGE never at anytime condemn those two idiots who cursed the malay lady. Those 2 idiots' behaviour must be in the same frequency with his, just like all his dogs. So just by giving cert. to the ladies for doing a good job, our dear leader thinks he can pleased and blindfolded the public. What cheap publicity ??? 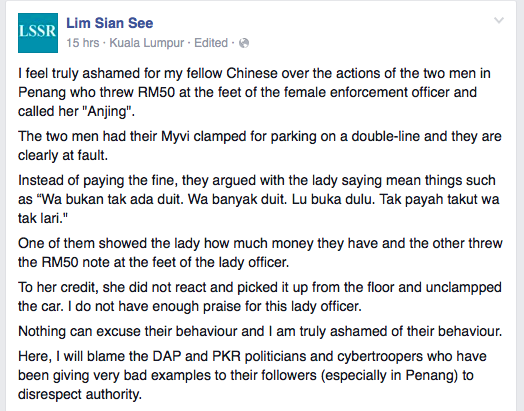 cina ...dah buat salah taknak mengaku...pompuan melayu tu sopan jer ...just doing her job. cina ingat diaorang kaya ...diaorang berkuasa...tapi bodoh! dah lah parking suka hati ....bodoh sangat nak bukak lock tu sendiri....pastu nak cabut tayar to get the lock out...idiot..
ni lah bodoh sombong + kurang ajar didikan dapig....even babi is far better then them.